Samsung Galaxy A7 (2016) has reportedly started receiving the Android 7.0 Nougat update in India, Chile, and some other countries across the globe. The update was first rolled out in Russia and recently the Nougat version was also spotted for the Galaxy A5 (2016) as well. The latest firmware update in India rolling out, comes with the build number A710FXXU2CQE4. Users need to have at least 1 GB of free space to download and install the OTA update on their device. Alternatively, you can also flash a complete firmware from below with no problems. Other countries with the same model number can also flash the latest Nougat firmware on their own Galaxy A7 device. The A7 model numbers receiving the update are SM-A710F/FD/M/K/L/S/Y. While the update is being rolled out in the form of an OTA update, there is also an option to manually check for updates by clicking on Settings >> About Phone >> Software Update. Now you can install ANDROID 7.0 NOUGAT onto your Samsung Galaxy A7 manually by using ODIN Tool and Android 7 firmware. 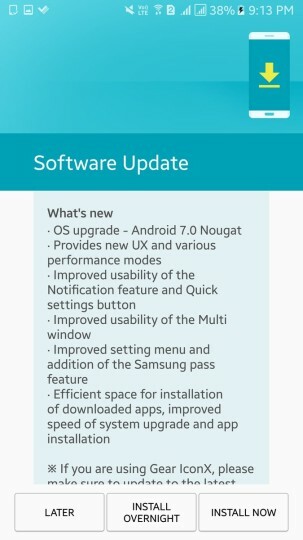 Android 7.0 nougat update for Galaxy A (2016) series brings new features like split-screen multitasking, improved Google keyboard, enhanced notifications, and a more customizable settings menu. The update also streamlines the user interface with support for ‘Double Tap’ on the recent button to switch between two most recent apps. Download the tool and nougat firmware from the links provided above. it is 100% safer and faster directly from Samsung servers. The SamFirm tool listed below has no restrictions for downloading the firmware. No speed limit, no bandwidth restrictions. Download Samsung Galaxy Android 7.0 Nougat Firmware directly from Samsung Servers. Here are third-party download links for firmware downloads. It has speed restrictions but is safe. How to update Samsung Galaxy A7 to Nougat firmware update? 1. Verify your device for compatibility. Download the file specific to your A7 variant from the link provided. 2. Enable USB Debugging on your A7 phone by going to Settings>About Phone> Tap on the Build Number several times until you get a new Developer Options in the Settings. Open Developer Options and enable USB Debugging and Advanced Reboot. 3. Enable OEM Unlocking from Developer Options just in case. You can disable it after the procedure has completed. 4. Make sure you have latest device drivers setup on your PC for a better connection. Get it from the download section official from the manufacturer. 1. Backup all your important files and data of your phone. 2. You should have at least 50% battery. 3. Do not skip any step. Step 1. Download the Nougat firmware and Odin software from the links provided above. Step 2. You have to enable the developer option. To enable it, GO TO SETTINGS > ABOUT PHONE > BUILD NUMBER, TAP IT 7-8 TIMES. Step 3. Install the Odin in your PC and run it. Step 4. Connect the phone to your via micro USB cable. Step 5. Switch off your phone and then press and hold Home + Volume Down + Power until the Download Mode screen comes. Step 6. If you see the blue ID: COM and the added message in the download mode, it means you can flash the software. Step 7. Locate the stock Android 7.0 Nougat for Samsung Galaxy A7 file, with a .tar or .md5 extension, downloaded earlier, and add it to the AP/PDA tab. Step 8: Check the Auto Reboot and F.Reset Time options. Step 9: Click on start it will begin the flashing, it will take few minutes, wait till you see the PASS message. That’s it friends if you have any problems please comment and let me know. Stay connected for more tutorials and knowledgeable posts. Thank you!